If you’ve wound up with more acorn squash than you can eat before it spoils, you can safely store it in the freezer, packaged in freezer-safe containers or storage bags for later use. Acorn squash can either be frozen raw or cooked, but the tough, inedible skin must be removed and the flesh cut into smaller pieces beforehand. Cooking before freezing is recommended if a longer shelf life is desired. 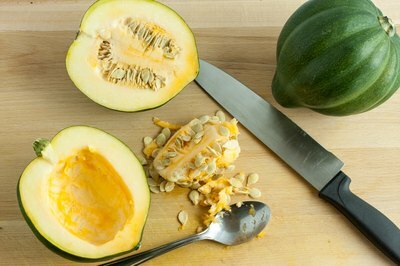 Remove the exterior skin and cut the acorn squash in half; remove all of the seeds and pulp. 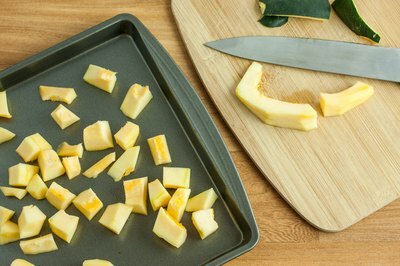 Cube the squash into smaller, like-sized pieces and arrange them in a single layer on a baking sheet. 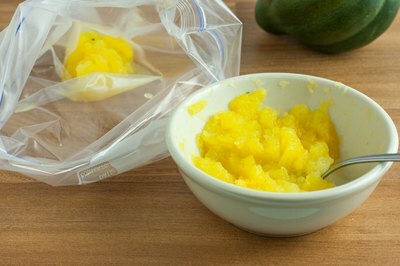 Once the squash pieces are completely frozen, transfer them to a freezer-safe container or storage bag. Mark the freeze date on the container. Raw squash does not freeze as well as cooked does, so for the best results, use as soon as possible. To prepare squash for freezing, roast, boil or steam it until the flesh softens. Remove the skin and all seeds and pulp. Mash the squash with a fork or potato masher and place it in a freezer-safe container or storage bag, leaving at least a 1/2 inch of space to allow the squash room to expand as it freezes. Mark the freeze date on the outside; cooked acorn squash lasts up to 8 months in the freezer. Can You Freeze Raw Hamburger, Cook It & Then Refreeze It?